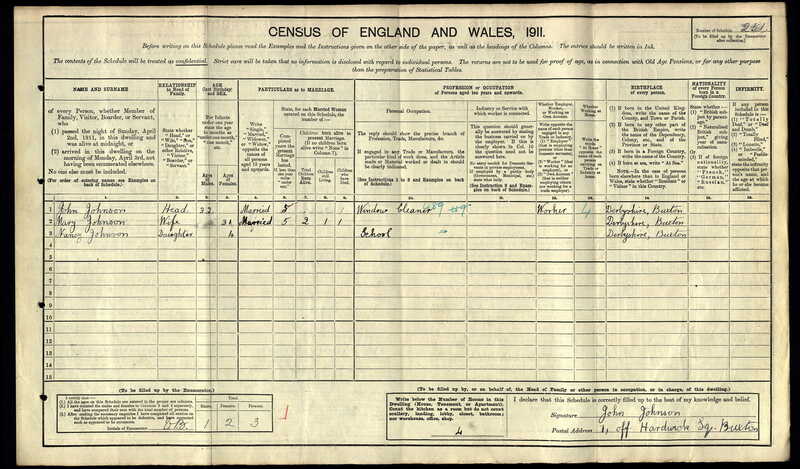 Henry was born in 1902 & in the 1911 census was living at 2 Marlow Street with his widowed Mother & siblings at his Grandfathers house. Henry enlisted into the Guard’s Service No. 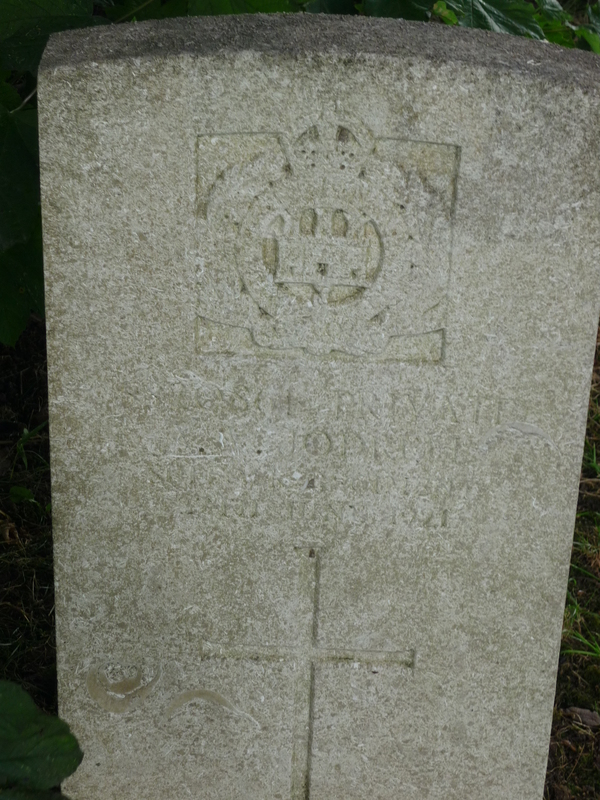 35564 on the 12th May 1919 however he was suffering from TB and was discharged on 2nd September 1919 never having served abroad, he died at home on the 9th October 1920, his grave is at St Peters Church he was just 18yrs old. Alfred Victor Jodrell was born in J/A/S Qtr 1897 in Longsight Manchester, register volume 8d, page 365, he was the son of Alfred an engine driver & Ida Jodrell. In the 1911 Census the family lived at 4 Marlow Street, Fairfield. Alfred died of the effects of War on 27th June 1921 at Bury St Edmunds, Suffolk, A/M/J Qtr volume 4a, page 808. 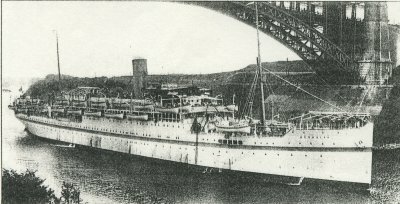 Captain Thomas Graeme Dickson FRCP RAMC Thomas was a Doctor and died on 27th April 1920 aged 53yrs, he served on the SS Neuralia which was being used during the first world war as a hospital ship. He served in the RAMC. 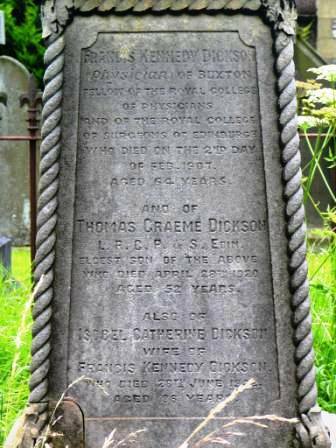 Thomas was the son of Dr Francis Kennedy Dickson FRCP & Isabel Catharine he was born in 1867 & was christened on 27th August 1867 in Buxton. 1881 Census: Thomas was aged 13yrs a scholar living with his Aunt in Streatham at the Vicarage. 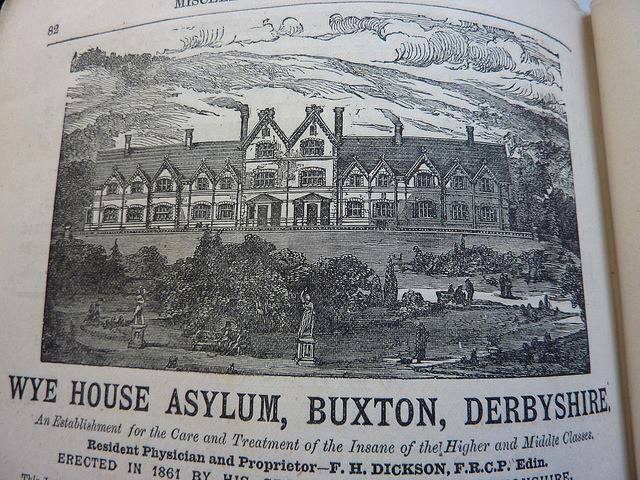 1891 Census: Thomas was a medical student living at the Wye House Lunatic Asylum where his father was Physician and a Justice of the Peace. 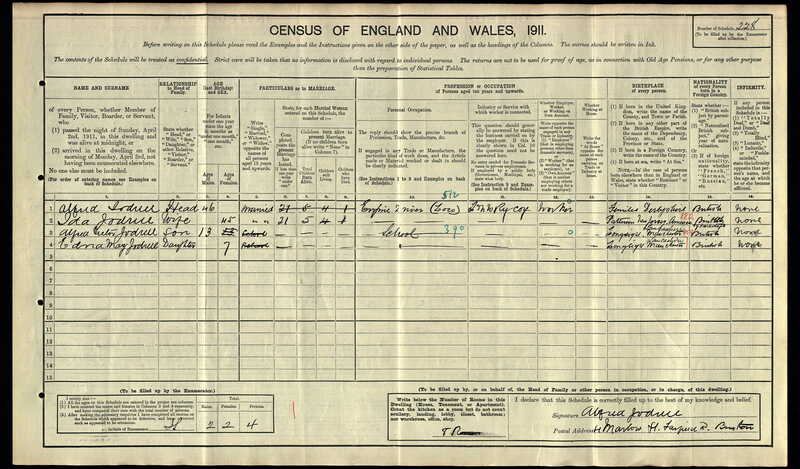 1901 Census: Thomas was living at 25 High Street, Long Eaton, Derbyshire aged 32yrs working as a Physician & Surgeon. 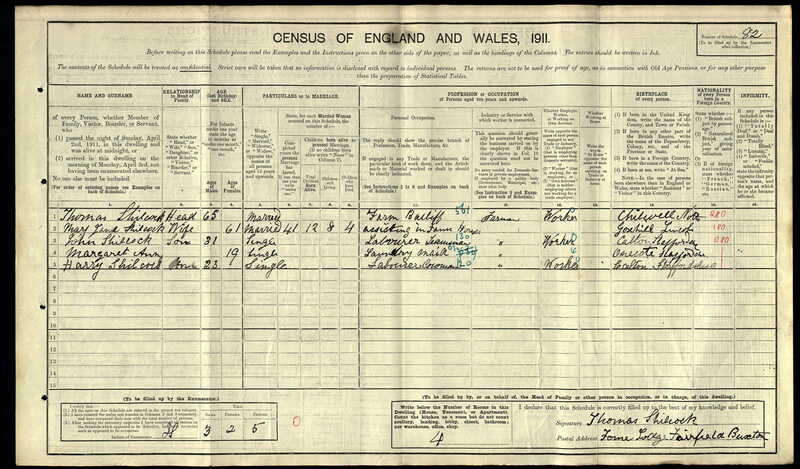 1911 Census: Thomas has taken over from his father at Wye House Asylum aged 43yrs, Corbar Road was in Fairfield. Thomas is living there with his wife Elizabeth Lister, daughters Katherine 12yrs & Elizabeth 6yrs. Later the family lived in Bakewell his grave is at St. Peters, Fairfield. Thomas Graeme Dickson’s grave at St Peters Church, Fairfield. 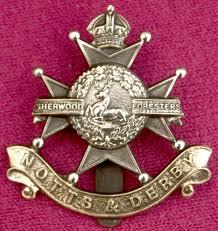 Notts & Derby (Sherwood Foresters) Pte: 16752. 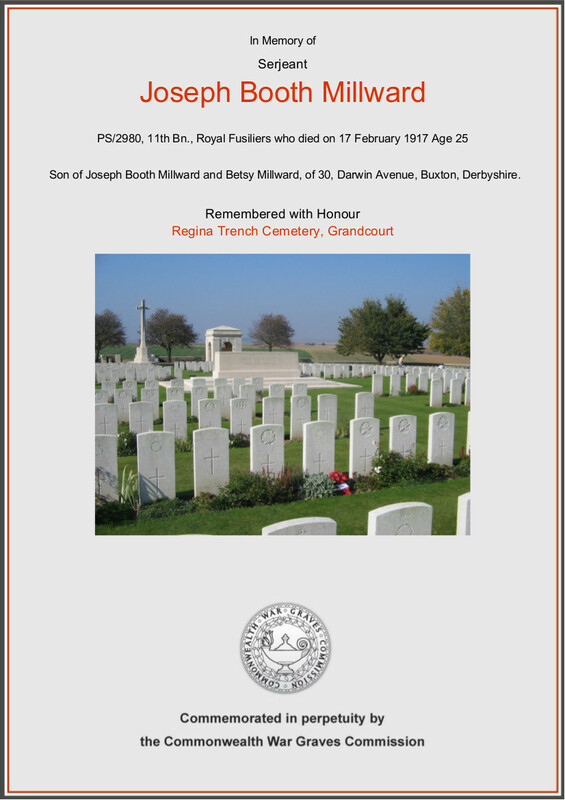 John Attested on 13th September 1914 in Buxton, he arrived in France on the SS Empress Queen 30th August 1915 in total he served 3years 8mths he was returned to UK 29th November 1917 and was transferred to the Army Reserves on 7th February 1919. 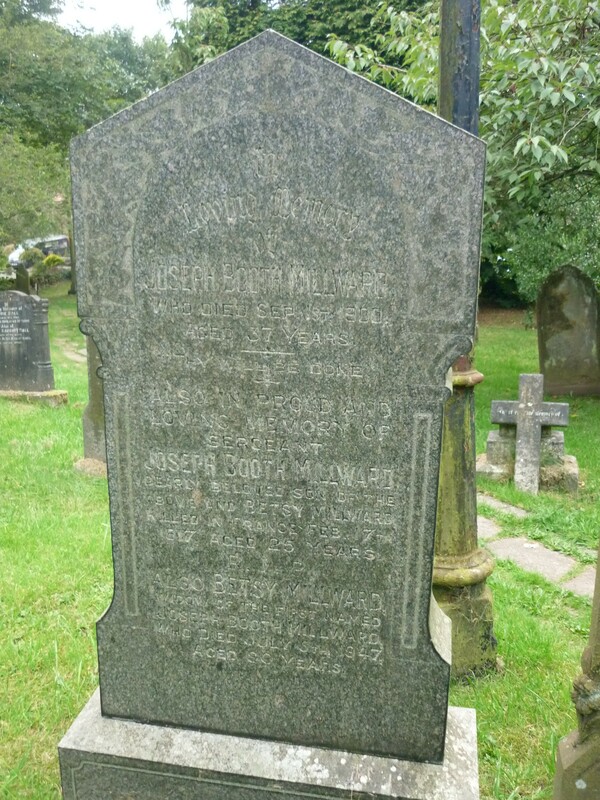 John was born J/F/M 1879 register Chapel-en-le-Frith vol.7b page.773. He was the son of Francis Johnson and Mary Manifold in 1891 John was living with his parents & Grandparents William & Elizabeth Manifold at Ash Cottages off Ash Street , he was still at school. In 1901 John was working as a Printers Compositor & the family were living at 2 Marlow Street, John was 22 yrs old. John James Cocker was born on 5th March 1876, he was baptised on 16th November 1877 the son of Ann Cocker, Buxton. The 1891 Census John was living with Mother Ann, 2 elder brothers Thomas & William, 2 younger sisters Mary & Matha at the home of William Gould, at Wormhill, Buxton. 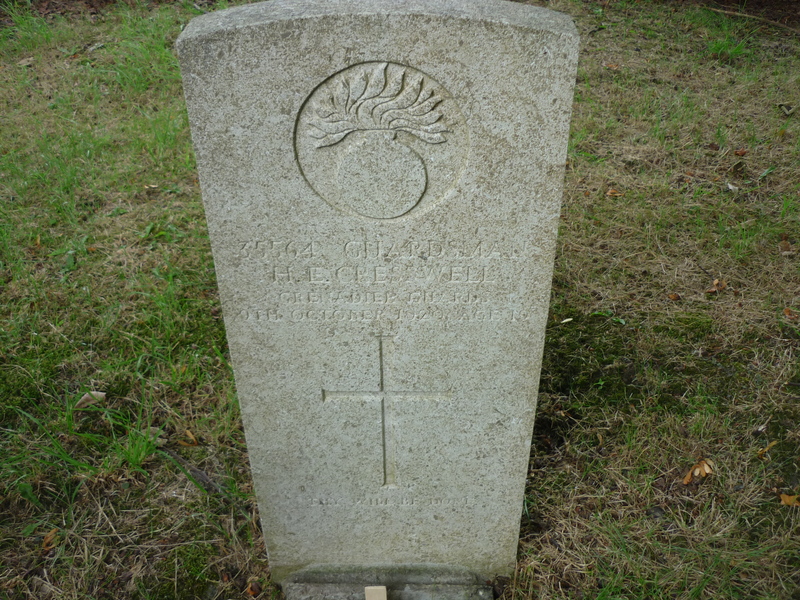 John served with the Royal Engineers Sapper 183815. Sapper J Cocker of Waterswallows, Fairfield, is over on well-earned leave, and his many friends in the district are glad to see him looking fit. 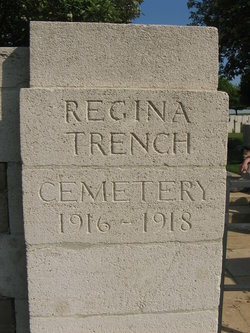 During the two years he has served with His Majesty’s Forces on the Western Front he has seen constant service, and has got through without mishap. It is hoped that now the fighting has ceased he may have the opportunity of returning to civil life in England. He has been heartily welcomed. 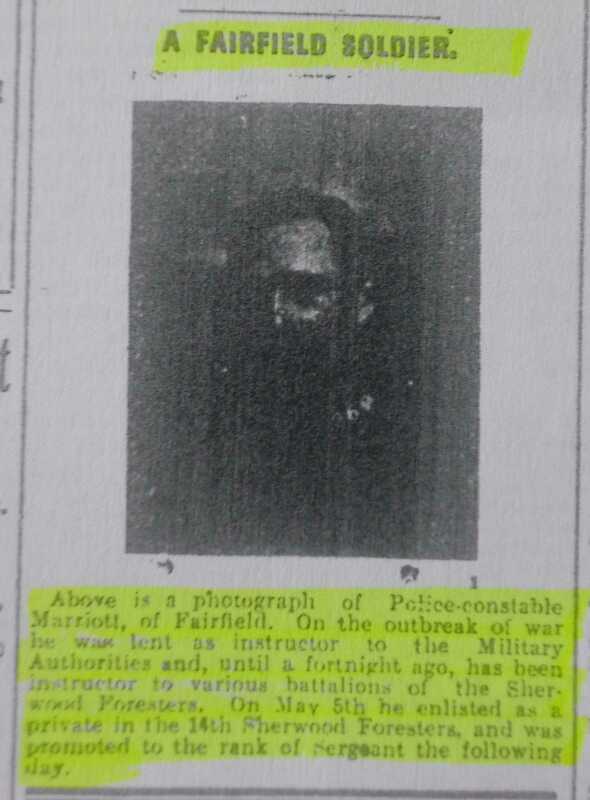 Reported in the Buxton Advertiser 23rd November 1918. 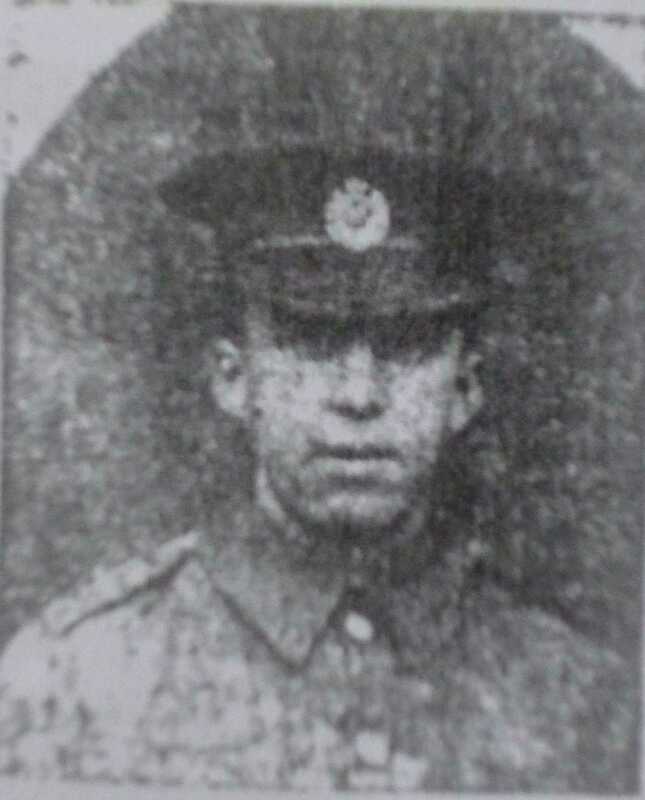 Pte Ernest Bennett, son of Mr and Mrs W Bennett, of Slater’s Cottage, Fairfield, is reported wounded in the shoulder and in hospital. This very smart young Fairfield lad, who is very popular with a large circle of friends, had not long gone out. It is hoped his wounds are not serious. 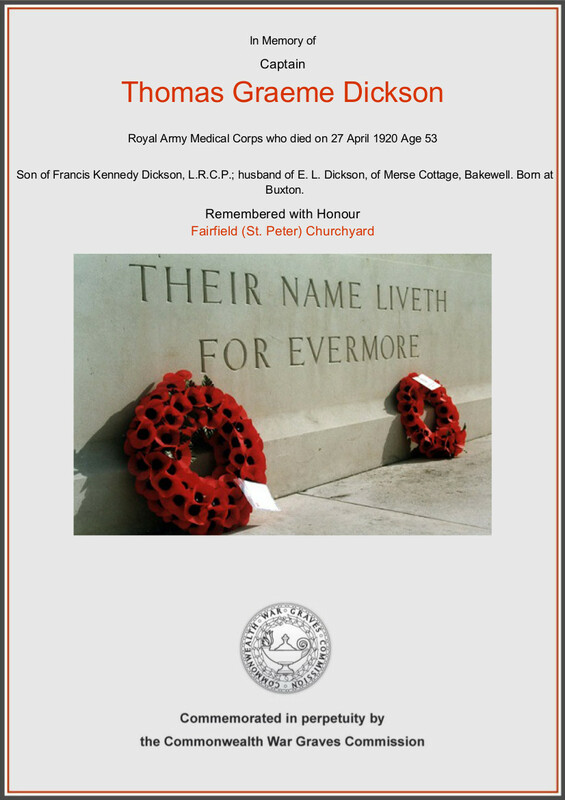 Ernest was born Fairfield in 1899 and was Baptised on 26th July 1899 at St Peters, Fairfield the son of William Arthur & Ada (Clayton) Bennett, in 1901 the family were living at Slaters Yard, Ernest had an older brother William & a younger brother Leonard. 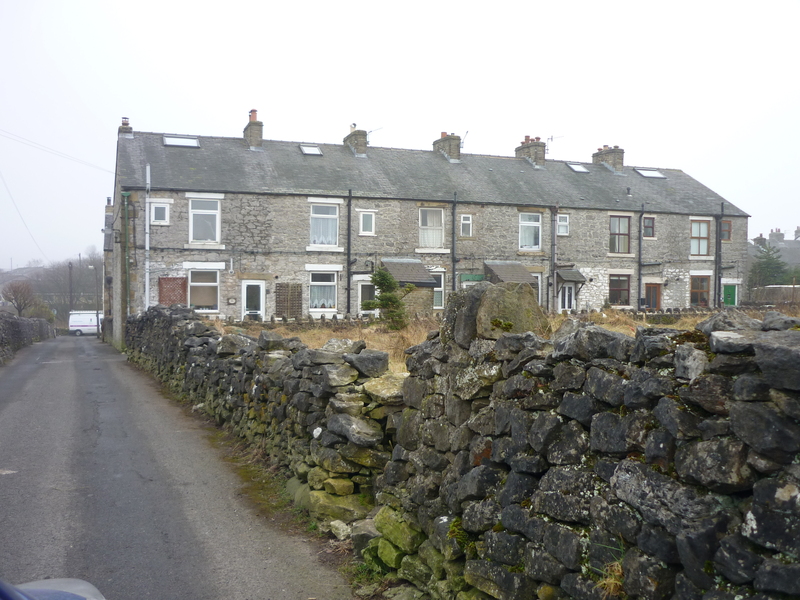 In 1911 the family with a daughter Constance were living at Slaters Cottages, Fairfield. Ernest married Lucy E Bonsall in J/A/S 1924. Harry was born in Calton near Ashbourne on 2nd February 1888 the son of Thomas (Farmer) & Mary Jane Shillcock. 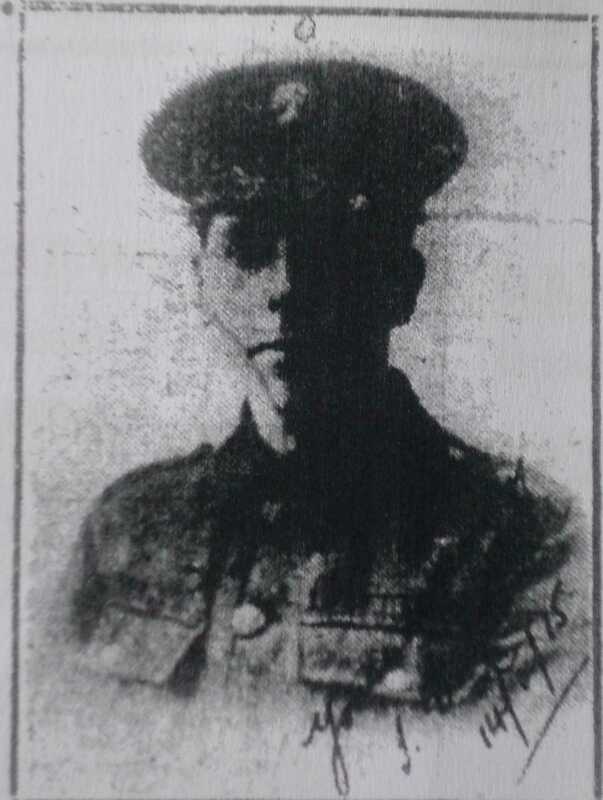 1904: Harry enlisted into the Army Pt 9211 Notts & Derby Regiment on the 5th March aged 18yrs 1mth, he was 5’7″ tall with Blue eyes & Brown hair. 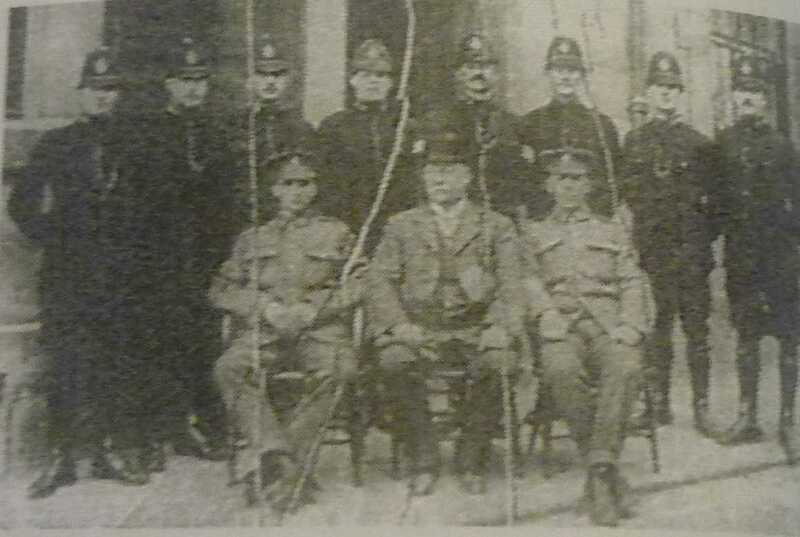 From 15th February 1907 – 21st February harry served in India. 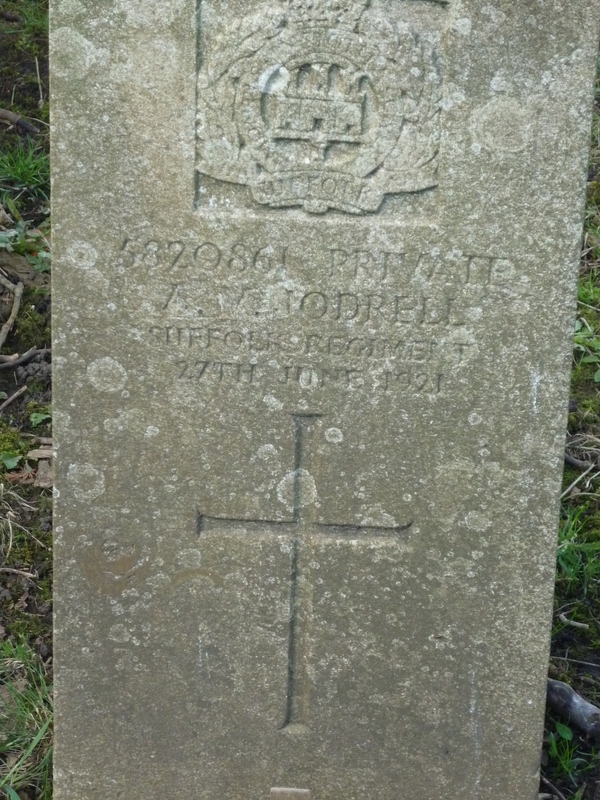 He was promoted to Lance Corporal 22nd June 1909 but on the 13th October 1909 at his own request he reverted to being a Private. Harry was transferred to the Reserves 2nd Class on 4th December 1909. Harry then returned to Fairfield firstly to his parents at Frome Farm, working as a Labourer. On 6th November 1913 Harry married Eliza Morris @ St Peters Church, the couple moved to 9 Heaton Place, on the 12th June 1914 the couple had a son Harry Jnr. Harry resumed his Military duties on 13th August 1914 joining 3rd Battalion Notts & Derby Regiment. He was injured by shrapnel in his back and was taken prisoner on 20th October 1914, he spent the next 4 years as a prisoner being released on 13th December 1918 & being repatriated home the following day. Altogether including his time in the Reserves Harry served a total of 15years 14days in the Army. Harry died in the June Qtr 1972, his death was registered at Chapel-en-le-Frith. Pte. 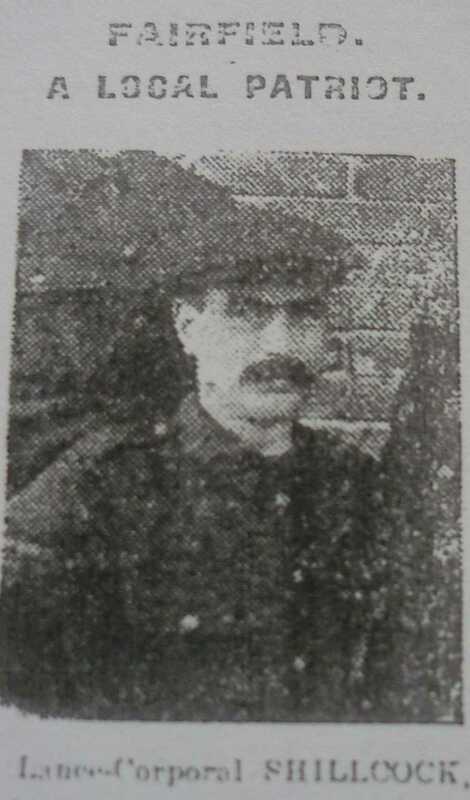 J Butler (picture from Buxton Advertiser) son of Mrs Mills of Cross Street, who has been home on leave has returned to his military duties this week. He took a hand in the bell-ringing on Sunday morning and evening at the Parish Church and his many friends in the district were glad to see him back amongst them and wish him the best of luck wherever his country calls him. Joseph Ernest Butler was born on 13th November 1895, he was christened at St Peters on 8th December 1895 the son of James & Agnes Butler. Joseph started North Road School on 22nd March 1899, the family then were living on Alma Street. In 1911 Joe was working as a Caddie at the local Golf Course, he was 15yrs old and at the time the family were living at 65 Queens Road, Fairfield. There are 3 marriages for John Ernest Butler, 1919 to Bertha Mellor, registered in Chapel-en-le-Frith, 1923 Elsie M Higginbottom registered in Chapel-en-le-Frith, 1946 Ethel Hilda Holland Cannock, Staffordshire possibly a third marriage for them both. Joseph B Millward was born in 1892, he had a younger brother Arthur Howard Millward, their mother was Betsy in 1901 the boy’s and their Mother were living at 20 Spring Gardens. The 1911 census has Joseph still living at home now 130 Darwin Ave, he was working as a Bank Clerk. Dear Mrs Millward. – It is with profound regret that I have to inform you that your gallant son was killed in action on the 17th of this month. We shall miss him terribly out here. He was such a brave fellow who could always be trusted to do his duty fearlessly and well. I relied on him implicitly in a tight corner and indeed at all times. I hope you will feel it a source of pride and consolation in your bereavement to know that he did not lose his life to no purpose, but at the furthest point forward of a successful assault – an assault which has had very far-reaching in making the enemy retreat. In this attack every officer in the company became a casualty and it was very largely owing to the leadership displayed by your son that the thrust was able to be pushed home into the hostile trenches. He had been doing his work so well that I had promised to recommend him for some leave, and had the military situation permitted, he would have had the opportunity of getting home. It is very sad that this cannot now happen, but at any rate his days recently were brightened by the hope of getting home and by knowing that his officers thought very highly indeed of him. We shall miss him terribly in the company, and on behalf of his friends and the men under my command with whom he served and by whom he was deservedly beloved, I send you my deepest sympathy. N. B. Mitchell Capt, Comdg. “C” Coy, 11th R.F. Joseph left everything to his widowed mother.